What is the opposite of an anniversary? An anniversary celebrates the calendar day on which something momentous happened at some point in the past. What do you call an event that marks the day something will happen in the future? 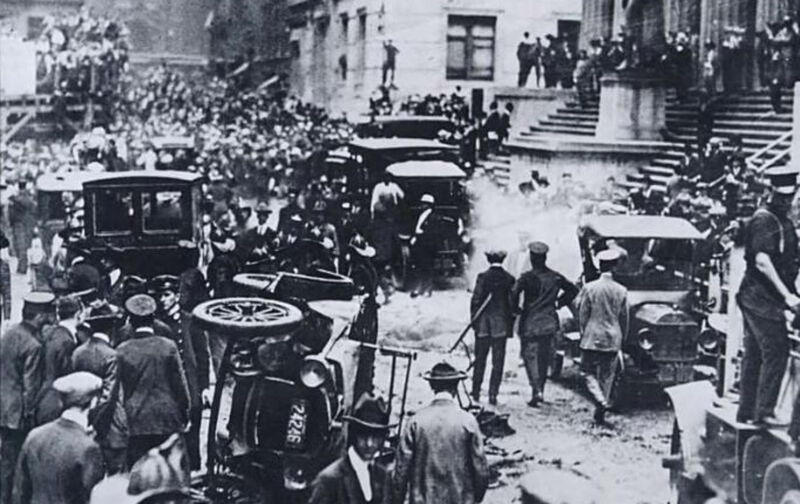 Hard to say, since time travel isn’t yet possible, but the still-unknown parties who bombed Wall Street on this day in 1920 could scarcely have timed their actions better. The explosion that killed 30 people outside the New York Stock Exchange came 88 years almost to the day before the collapse of Lehman Brothers and, nearly, the national and even the global economy. On September 16, 2008, there were no few Americans wishing for a repeat. That sentiment may have passed (in some corners not entirely so), but the mystery surrounding the Wall Street bombing of 1920 never has. The Nation, for its part, regretted that some radical elements could be so wrong about how to achieve deep and meaningful change. At this writing it appears that the explosion in Wall Street was either the act of a single criminal fanatic or the deliberate conspiracy of a group. In either case censure and denunciation must be unqualified. If it was the act of an anarchist or anarchists, its stupidity is exceeded only by its criminality. Every forward movement will suffer from the act; every reactionary force will be strengthened by it. This country will never be made over by any such means. Just when we have had the clearest illustration the world has ever witnessed of the futility of the policy of seeking to establish might and right by force, it is the saddest of commentaries that there are still men so misguided as to believe that anything can be accomplished by murder in any fashion. Bomb-throwers fortify and strengthen the system they attack. Anybody who reads history knows that nothing worth while was ever achieved this way; events all over the world are proving that only by avoiding bloodshed and violence can the world truly advance. The doctrine of reforming others and changing opinions by “force without stint” only makes the condition of humanity worse.